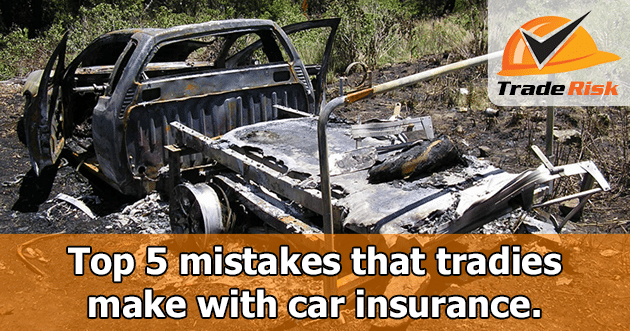 We’ve put together a list of the top five traps to avoid when insuring your work vehicle. This is potentially the most common mistake, but it’s easier to make than you think. Whenever you insure a vehicle you need to tell the insurer that the vehicle is being used for business purposes, even if you own the vehicle in your personal name. This mistake can happen quite easily for tradies in the early part of their career. They might have purchased and insured their ute when working for someone else, then when they switch to running their own business they keep using the same ute without updating their insurance. If you need to make a claim and the insurer finds that you’re using the vehicle for business purposes without telling them, they could deny your claim and leave you thousands of dollars out of pocket. 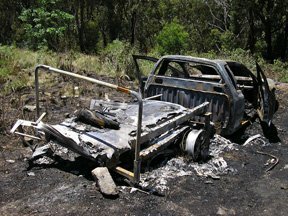 So if you’re using your ute, van or other vehicle for business, tell your insurance company! 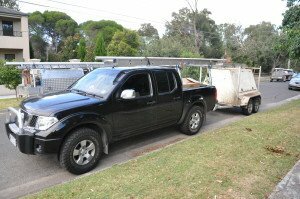 Many tradies tow a trailer around with their ute, and some assume that their car insurance will include anything they tow. Whilst many insurance policies do include some cover for a trailer, it is generally quite limited. 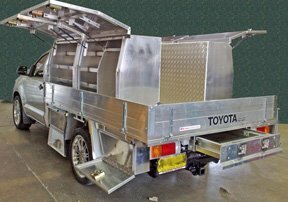 AAMI – Will only cover two-wheel trailers up to $1,000. Budget Direct – Covers trailers up to $500. NRMA – Covers trailers up to $1,000. Youi – No cover unless you pay an additional premium. The above information is current at 30 July 2018, based on information from the Product Disclosure Statements accessed from the relevant insurer’s website. A proper commercial motor insurance policy will generally provide a greater level of cover (up to $2,000 for one of the policies we use at Trade Risk) however if your trailer is worth more than a couple of grand we recommend a separate trailer insurance policy. 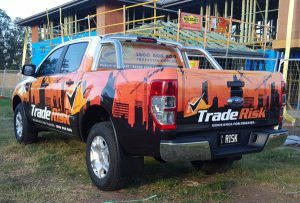 A typical tradies ute is a lot more than just a ute off the showroom floor. The same goes for a van. Often the ute or van will be decked out with ladder racks, canopies, checker plate boxes, shelving, drawers and all sorts of setups. Such setups can sometimes cost many thousands of dollars on top of the cost of the vehicle itself. So you buy your new ute for $40k, insure it for the purchase amount, then spend another $5k on the fit-out without telling the insurer. If your vehicle is stolen or written off the insurer will give you $40k for the vehicle, but you’ll still be $5k out of pocket for the fit-out. It’s not that the insurer won’t cover that extra fit-out, it’s just that you need to increase the value you are insured for. Vehicle signage is a massive part of your local marketing for a trades business, especially for electricians and plumbers. 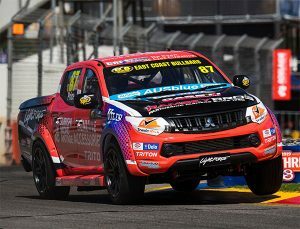 It’s not uncommon for a full wrap on a van or dual cab ute to be around $4k, which is not an amount you’d want to risk losing. Most of the common car insurance companies we looked at (as listed earlier in this guide) had no specific mention of signage in their product disclosure statements. We suspect you might be able to have the signage added as a modification, but we haven’t called to ask. Either way, if you insured your vehicle for its purchase price or market value without telling the insurer about your $4k wrap, you could be well out of pocket in the event the car was stolen or written off. One of the commercial motor policies we use at Trade Risk has a specific clause providing cover of up to $5k for repair or replacement of signage on work vehicles. If you’ve chosen to take out an online or over-the-phone policy through one of the mainstream insurers, it’s great that you at least have some cover in place! But if you’re running a business and rely on your vehicle for that business, you really should be using a proper business insurance policy. Some of the benefits of doing so have already been detailed above. Better trailer coverage and coverage for your signage is just a start. A proper commercial policy may also provide better coverage for a hire vehicle, as well as replacement windscreens with no excess. Of course this all depends on which policies you are comparing, and that’s the benefit of using an insurance broker like Trade Risk who can do the comparisons for you. Using a commercial motor insurance policy may be a little more expensive than a standard policy through someone like NRMA or AAMI, but you may find that the cover is far more appropriate for a commercial vehicle. To find out how Trade Risk could help with insuring your ute, van or truck please call us on 1800 808 800 or contact us online.